New Electronic Progressives coming to The Eye Bar! Some extraordinary technology is coming to The Eye Bar in a few months! If you have had troubles adapting to progressive or bifocal lenses in the past or want to try the cutting edge of progressive lenses, then you have to take a look at eMpower lenses from Pixel Optics. eMpower! is the world's first electronic focusing eyewear. It puts control of the visual experience back in your hands. eMPower! lets you have the lens power you want, when you want it. At the touch of a finger, you can turn the full reading power on and off as you need it. Tips on Cleaning your Eyeglasses! If you wear eyeglasses, seeing clearly is important. Since eyeglasses -- especially prescription eyeglasses -- can be expensive, it's critical to maintain their upkeep and clean them correctly. For example, using a dry tissue to clean lenses can leave small scratches on the glass from the harsh woven fibers in the tissue or from abrasive sediment already settled on the lenses. Never ever use glass cleaner or other harsh abrasives! However, there are other tricks you can use to successfully clean dirty eyeglasses. Nice video showing secrets of Chanel Eyewear and some of the manufacturing process. Lots of attention to detail. The new glitter Chanel Sunglasses are stunning! One of our friends and customers at The Eye Bar is Kathleen Herring. She is an extremely talented graphic designer and an avid eyewear aficionado! She is a wonderful example of someone who loves her work and really lives it. We are very fond of the fact that Kathleen has truly made eyewear her signature look. Take a look at her website http://kathleenherringdesign.com. It will give you a little insight into whats shes about and the great work she does in the area of design. Great new L.A. Eyeworks just arrived. Super fun shapes and colors. Get funky and fun. We usually recommend prescription sunglasses instead of clips or transitions, there is another way. Its called Chemestrie Clips and is a great alternative. A tiny magnet is drilled near the outside of your lens. The sunglass clip, reading clip or 3D clip then just attaches right on to the front. 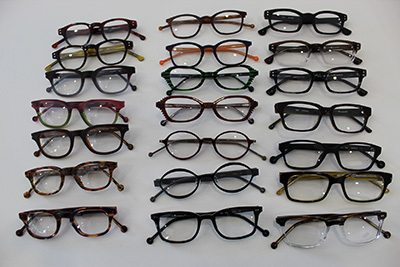 Lightweight and durable, they are a great option to add to an existing pair of glasses or new ones. Theo Eyewear is finally here at The Eye Bar!